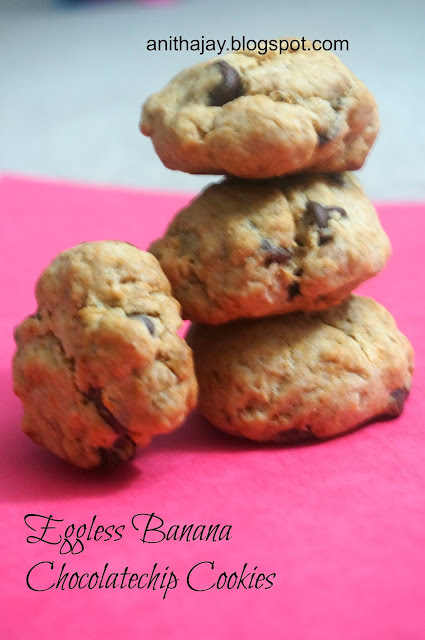 For 28th Potluck Party,cyber Style , i need to try Shree Rao's dish Egg less Banana chocolate cookie chip cookies. In a mixing bowl cream butter and sugar.Add vanilla and beat. Now add Banana puree and beat well. In a separate bowl sift flour ,baking soda and salt. Add the dry ingredients to wet little by little and form a soft dough. Finally fold in the Chocolate chips. Cover the dough and refrigerate for 1 -2 hours. Remove the dough from refrigerator and foam a lemon size balls. Place it in a Baking sheet 2 inch apart and Flatten gently using your palm or back of the spoon. Bake it for 15 - 20 minutes or till edges turn to golden brown. Remove from oven and let it cool on wire rack and then serve. Linking to pot luck party cyber style.